Carols for Christmas with Bel Canto and St John’s school choir. We have a stunning programme of seasonal music lined up with carols old and new. Rehearsals are going well for both choirs – it’s going to be a fantastic concert! ‘A retrospective of songs and more’ was an apt subtitle for the recent Bel Canto ‘Encore’ concerts in Swinton and Sheffield where audiences were delighted by an eclectic mix of music old and new chosen by members of the choir. Robert Webb made his debut with Bel Canto having recently taking up the post of Musical Director only seven weeks ago and was very well received by choir and audiences. Jonathan Gooing accompanied on piano and organ in his own inimitable style and delighted the audience further when he and Robert joined forces to play popular piano duets by Walton, Mozart and Grainger at St Andrew’s, Psalter Lane. Lauren Sawden was the guest pianist at St Margaret’s, Swinton performing Poulenc and Debussy so movingly. Many thanks to all our loyal supporters and to new friends who came along for the first time. 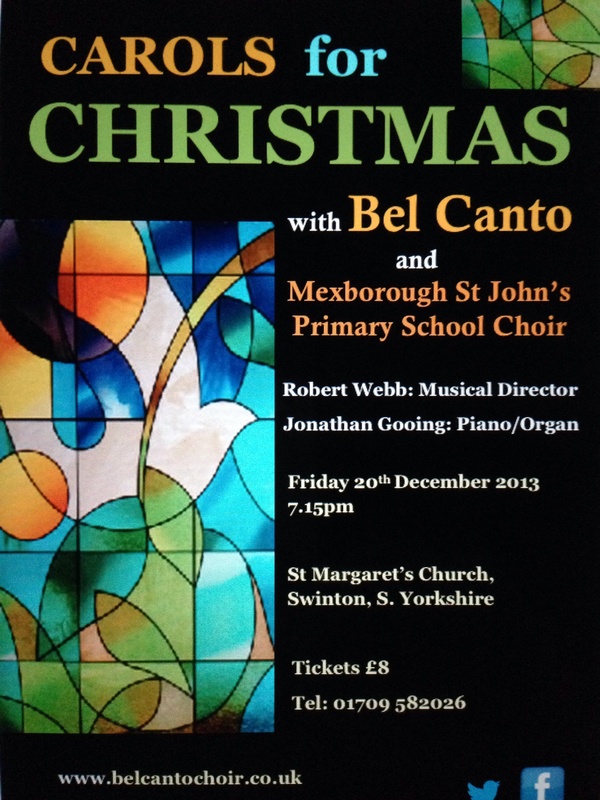 Rehearsal start this week for Christmas when Bel Canto will be inviting the children from Mexborough St John’s Primary School Choir to join them again to create some Christmas magic through carols old and new.